An oval basin designed to be under or overmounted in the bathroom vanity. Overall, it is hand-hammered by a skilled artist with a classic punch texture. The R4-4002 is constructed from a single sheet of 99% pure copper and measures 19" x 15 3/4" x 6". It will not rust or stain, and features an ever-blooming patina which adds a rich antique coloring to the surface. Quality is guaranteed by a limited lifetime warranty. Template and mounting hardware are included. 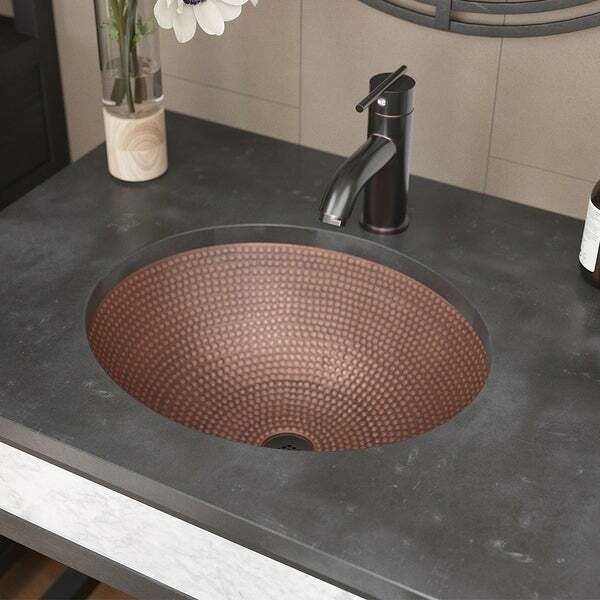 In addition, to prevent any debris from running into the plumbing below, a grid drain in an antique bronze or oil-rubbed bronze finish is included. Dimensions 16.0 In. X 19.0 In. X 6.0 In.